Dexion Construction Systems provide the materials and method for you to build your own bespoke structures, allowing you to tailor solutions to match your individual needs. ‘Off the shelf’ products don’t always match your requirements, but with the right raw materials, tools and a little ingenuity you can design and build your own unique solutions to the challenges of your workplace. Designed for ease of use, quick assembly and with a wide range of components, features and options, Dexion construction systems offer you the ability to create the exact storage, support and display systems that you require. 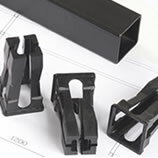 Both Dexion Slotted Angle and Dexion Speedframe are the preferred options for most manufacturing companies, set builders and industrial engineers when something non-standard and bespoke is needed. A quick and straightforward way to build strong and visually appealing frameworks, Dexion Speedframe is the perfect solution when you want to build your own ‘made to measure’ products. Simply cut the square tubing to the required length and tap in the joints for a smooth and snag free structure. All constructs can be easily adjusted or dismantled and the components re-used. From benches, trolleys and display stands to counters and workstations, the number of applications is endless and limited only by the user’s imagination. 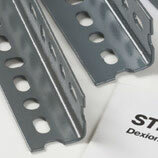 Designed to be a general purpose product, Dexion Slotted Angle is versatile and strong with near limitless application. Whether it is used to build specialist shelving, racks, trolleys, benches, mounting jigs, suspension systems, security caging or support frameworks, it gets the right angle on every job. The lengths are easily cut and bolted together for the quick construction of frameworks that can be readily modified or completely dismantled and the components re-used.